This post was first written in 2007, when I was a very new blogger. I like to take it out and look at it every October. Please excuse the formatting; I had trouble with it when this post was first published, and am still having problems with it now. I am the sunlight on the ripened grain. I think of that poem when it is time to celebrate Los Dias de los Muertos (Days of the Dead) here in New Mexico, observed from October 31 to November 2. On November 1st the souls of children—los angelitos—are believed to return, with adult spirits following on November 2nd. It’s a time to celebrate the lives of those who are no longer with us. In her book Animal, Vegetable, Miracle, Barbara Kingsolver tells how she is drawn to this celebration because our culture “allows almost no room for dead people.” It’s true, we honor our military dead in a formal way on Memorial Day and on Remembrance Day, but there really is no holiday that gives us a chance to honor our own lost loved ones in a personal way. When I first moved to New Mexico and experienced Los Dias de los Muertos, I have to tell you that it shocked me in some fundamental way to see children happily munching on candy skulls, surrounded by grinning skeletons on display and altars (ofrendas) built in remembrance of the dead—perhaps for a grandmother or grandfather, a beloved pet, or even, in the case of the Las Cruces Museum of Natural History, an altar built in memory of extinct animals. 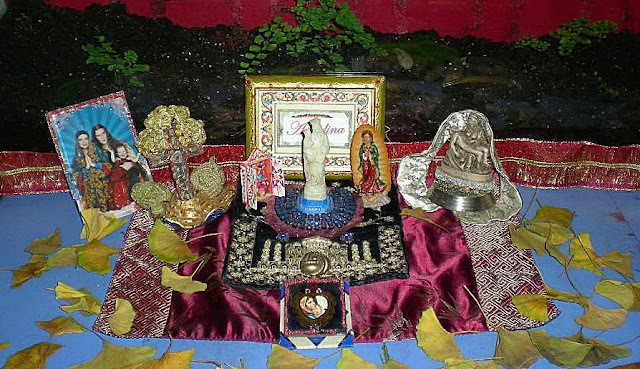 Some ofrendas may be publicly displayed, as they are in the plaza of La Mesilla in Las Cruces, and some may be built at home. The altars might contain pictures of the deceased, religious symbols, objects to remind us of the person, dishes of their favorite foods, marigolds, and lots of candles—maybe even a calavera (also a colloquial term for skulls), a short mocking poetic epitaph. I was amazed to see the familiar attitude expressed toward death—a kind of sly, humorous, and elbow-nudging nod to our mortality. Here is a calavera that I found on a teacher web site, with their English translation. I guess I needed to undergo an attitude change toward death, because it was something I was so uncomfortable with. I believe that now I’m ready to take part in the Days of the Dead celebration. I have the short life of my own little “angelita,” to celebrate. My daughter Angelina, who died not very long after being born, has never had a birthday party and has never been included in any other family celebrations. This year, I will build an ofrenda to help remember her, and I’ll make another for the lives of my parents. Please enjoy my sister's photographs of the amazing ofrenda she built in Angelina’s honor. Thank you, dear Auntie. *Note about the poem, "Do Not Stand at My Grave and Weep" from information I found out on further research: It turns out that there is much controversy surrounding the origins of this poem. Some believe that it is the work of Mary Elizabeth Frye (1904-2004), but apparently she neither published nor copyrighted it, although that doesn't mean she didn't write it. It is often thought to have native American origins. On the prayer card from the funeral of my friend, it is called a Hopi poem.